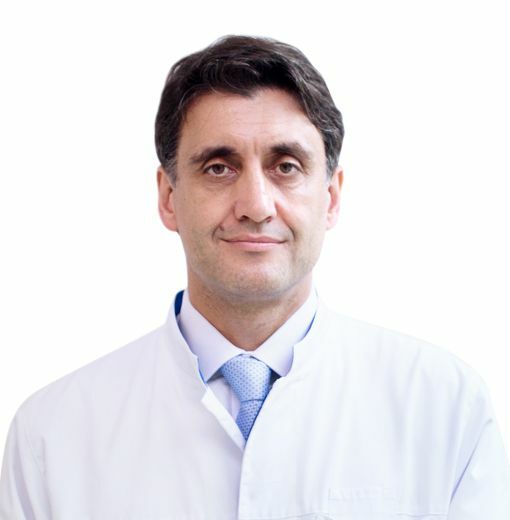 MATVEEV Vsevolod, Doctor EMC. Make an appointment, ask a question. M.D., Ph.D., Professor. President of the Russian society of oncourologists, expert of the European Association of Urologists (EAU) section «Prostate cancer». Graduate of the medical faculty of I.M. Sechenov First Moscow State Medical University. After graduation worked as a doctor in the clinic of National Research Institute of Urology of Russian Ministry of Health. From 1990 till 1994 achieved Candidate’s degree in National Research Institute of Urology of Russian Ministry of Health. In 1994 defended a thesis on theme: “Benign kidney tumors. Clinical presentation, diagnostics and treatment.” After Candidate’s degree was admitted to work in N. N. Blokhin Russian Oncological Scientific Centre on a position of a surgeon. From 1995 till 1997 worked as an urologist in Royal Free Hospital, London. By the end of the work in England received a certificate of trainee of the Royal College of Surgeons of England. In 2002 had a Master thesis defense on theme: “Surgical treatment of metastatic kidney cancer with venous invasion”. In 1997 was admitted to work as a research fellow in the Urology Unit of N. N. Blokhin Russian Oncological Scientific Centre, in 1999 – as a senior research fellow. Since 2005 is the head of the Urology Department of Federal Budgetary Institution N. N. Blokhin Russian Oncological Scientific Centre. In 2007 achieved the title of Professor. Works in the European Association Of Urologists in the group establishing European standards of prostate cancer diagnostics and treatment. Active participant of major international clinical investigations. The doctor was awarded for a great contribution to scientific investigation realization by the European Organization for Research and Treatment of Cancer (EORTC). Author of 350 scientific works, published in Russia and abroad, including 8 monographs, 3 educational books and films. 22 Candidate’s degree thesis and 1 Master of science thesis were defended under the guidance of the doctor. Member of the Academic Council of N. N. Blokhin Russian Oncological Scientific Centre of Russian Ministry of Health, member of the editorial board of journals “Urology”, “Oncourology”, “Russian Oncological Scientific Centre Bulletin”, “Andrology and genital surgery”, Russian editions of Journal of clinical Oncology, Cancer World, member of the European Organization for Research and Treatment of Cancer (EORTC), member of group, which establishes standards of the European Urological Association (EAU), president of the Russian Society of Oncourologists, deputy president of board of directions od Russian Society of Urologists, trainee of the Royal College of Surgeons of England, honorary researcher of the Royal Free Hospital.